You see, last year I chose the word Grateful. Such a good, noble word – a worthy pursuit! Choosing a Vision Word or Focus Word, like Visioning and Goal Setting, is a pretty powerful practice… Just the act of writing something down seems to have flow on effects. It might seem a little weird and mystical (and it is), but there seems to be something in it, which is why I decided to ditch New Year Resolutions a few years ago and go this way instead. A greater appreciation for the many good things I am blessed to have. I did not see it as a challenge to God, The Universe and anyone else out there, to make sure that I learned what the word REALLY meant! 2013 certainly had its highlights (a cruise on the QM2 anyone? ), but it also rocked me to my core, as so many aspects of my life came crashing around me. What I learned was to be grateful just for the basics – my home, my marriage, my family, my friends, my skills and knowledge – in other words, the rock solid foundation upon which my life is based. Nothing else really matters. So how does one follow up such a year? Well, if the saying, “Gratitude is the open door to Abundance” is true, I’m ready for the Abundance part now, thank you very much! 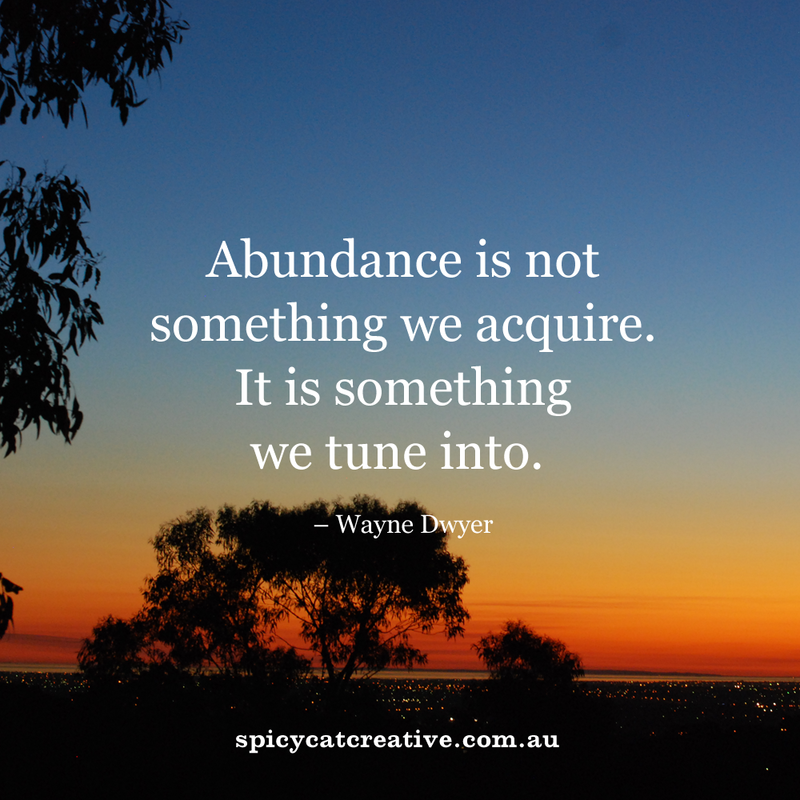 Abundance… what does it mean? Far more than just piles of money (although that would be nice too! ), it is more about tapping into the flow of love, joy, prosperity, success, generosity, vivacity, kindness and all the other good things of life. It is the opposite of scarcity – something that has underwritten too much of my thinking for far too long. So many great ideas quashed because someone else already does something similar. Too many opportunities lost because “that’s so-and-so’s field – I can’t possibly impose on their turf”. Things I should have done were left undone, for fear of competition, fear of not being the best, fear of failure. My challenge for 2014 is to discover and explore what it might mean to accept that there IS enough to go around… enough joy, success, happiness and opportunity for EVERYONE, including me. In short, Abundance. Of course, after the lessons of the past year, this terrifies me, in a “Be careful what you wish for” kind of way. What if it’s not all good stuff coming my way? What if I wind up receiving more than I bargained for? What if I can’t cope? Well, I suppose that will make for an interesting post next year! Do you have a Focus or Vision Word for 2014? Care to share? Fortunately, I am off to a good start. That gorgeous sunset in the image above was taken from my front balcony. If that’s not abundant, I don’t know what is! PS. Did I mention I am linking up with the lovely Bron from Maxabella Loves for our One Word posts? Check out some others here. Originally published at Spicycat Creative.